We are starting a new series of mini testimonials, “Soulful Snapshots” if you will, of our travelers! First up is Precious, who hails from Georgia, USA! 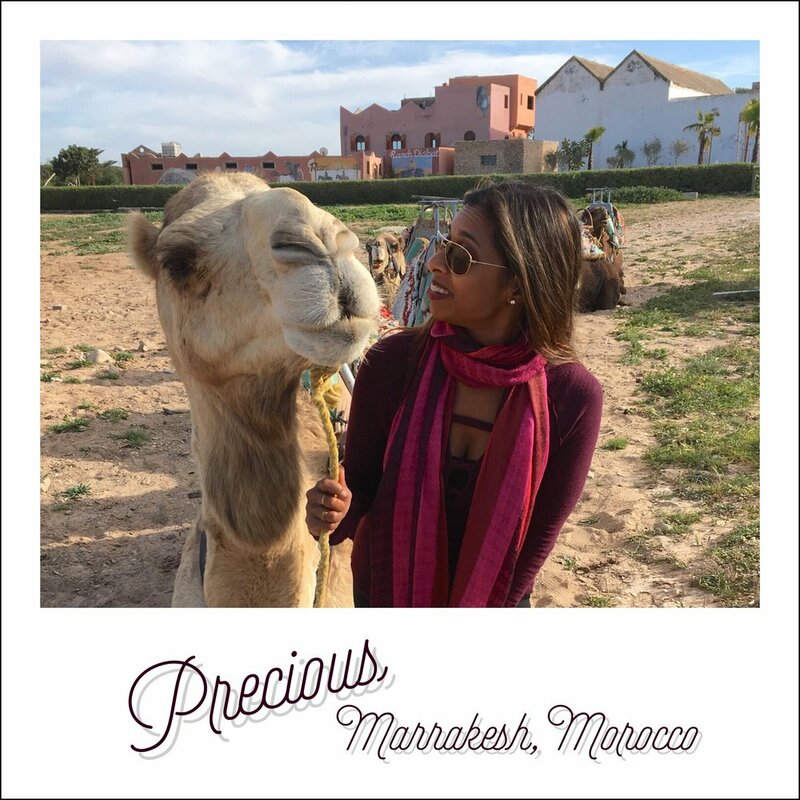 She joined us in Marrakesh, Morocco and wrote us the loveliest note about her time on retreat. We are so lucky to meet such incredible people on our journeys. I cannot thank you enough for the most unforgettable experience in my life. My trip with EPM was beyond my expectations. To this day, I still reminisce about every moment from that trip. To be honest, if I didn’t have photos, I would think that I had dreamt the entire experience. From the moment I sent you an email asking you dozens of questions about the trip, .you were gracious, kind and patient. Thank you. When I first arrived to Peacock- I couldn't believe my eyes. It was everything I had hoped for and more. From the Aladdin tents dressed in an array of bright and beautiful colors to the incredible gourmet cuisine. It was perfect. When I was taken to my room...I expected to meet my roommate. Only to find out that you had placed me in my own special room for my birthday. I simply couldn't believe the blessing I had received to stay in such a gorgeous room and to be treated with such love. I truly felt like a princess. I get emotional just thinking about that moment...walking into the Pavillion and seeing my room for the very first time. It simply brings tears to my eyes...happy ones at that. It came at a time in my life where I needed it so much- so thank you! It will forever be- the best birthday I could ever wish for! Every single moment of my trip was beyond my expectations and likely one of the most magical and memorable moments of my lifetime. My only regret is not having contacted you immediately after the trip to send you a wholehearted thank you for creating a memory and experience of a lifetime. I will never, ever forget my experience. Please accept my heartfelt thank you. Thanks so much, Precious, for taking the time to write and let us know what the experience was like for you. We are grateful to have had you on retreat! You can join us on retreat in Marrakesh this fall, Sept 22-28, 2019!